This past month has been crazy. We’ve welcomed Noah into our family and had to deal with some major breastfeeding issues, mostly his tongue-tie and latch-issues. Because of his set backs we are bottle feeding him expressed breast milk which I have been pumping about 5 times a day. I finally invested in a good double pump but pumping while trying to tend to a new baby and busy toddler is tough. I need to have my hands free in order to multi-task. I had been looking at hands free pumping options when I discovered PumpEase hands free bra. While I’d seen several utilitarian hands-free pumping products PumpEase was definitely the cutest. I received the tuxedo style PumpEase and I LOVE it. It is simple to put on and use. It goes on just like a bra (except with the clasps in the front) and the horns of the pump slip right in and I’m pumping in no time. I have free hands to help Jude open his snack or pop the paci back in Noah’s mouth. It’s awesome. I love that the PumpEase is available in a variety of patterns and sizes. I have a size Large (since I’m normally a 36G – but bigger while breastfeeding) and it fit perfectly. Check out their Fitting Room for the size you need, pick a fun print and get a Do Not Disturb door hanger. 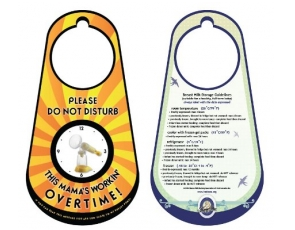 Win – One lucky reader will win a PumpEase hands free pumping bra, door hanger and magnet. Visit PumpEase and the Leave a comment telling your favorite design. Please leave a valid email in the comments if your Blogger profile is private so that I can contact you if you win. Giveaway ends 8.3 at 11:59pm EST. Winner will be notified by email and has 48 hours to respond or a new winner will be chosen. See giveaway rules for more information.